I’ve been home on vacation through the holidays. Part of the joy of being the executive chef for a Southern university is getting holidays off with the students. Being home has rejuvenated some of my creative juices, so today I decided to make some homemade, not from a bag or box, brownies. Salted caramel seems to be the flavor profile this season so I knew I wanted to try that with these brownies. They turned out delicious and were so easy to make that I wonder why so many people rely on Duncan Hines? My only gripe is that I like my brownies a little more chewy; these are a little cakey but still delicious and will be wonderful with some ice cream for dessert tonight! Preheat the oven to 350F. Spray a 13″x9″ glass baking dish with Baker’s Joy cooking spray with flour (or similar). Line the dish with parchment paper leaving enough to go up the sides, then spray the parchment paper again with the cooking spray. In a microwave safe bowl, add the butter and the baking chocolate and cook on high for 1 1/2 minutes, stirring every 30 seconds, until smooth. The the bowl of a mixer, combine the eggs, sugar and salt and mix on high for 3 minutes, until light and fluffy. Add the flour, cocoa and vanilla and mix to combine. Stir in the caramel candies and the melted chocolate/butter mixture, then spread the batter in the baking dish. Bake for 20-25 minutes or until a toothpick inserted in the middle comes out clean. Remove from the oven and sprinkle the top liberally with sea salt. Let cool on a wire rack for 10 minutes, then lift the brownies out by the parchment paper and let cool completely on the wire rack. Once cooled, remove from the parchment paper and cut. Store in an airtight container. 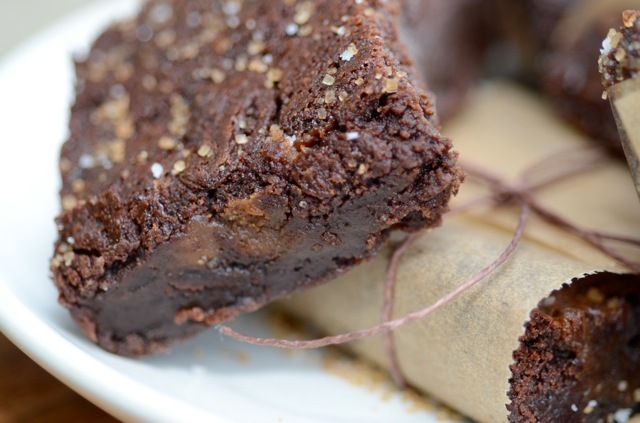 This entry was posted in Uncategorized and tagged brownies, caramel, parchment paper, Salted caramel by quarlj01. Bookmark the permalink. Campus dining is a totally different world. I miss all of you as well, but I’m adjusting to my new life. Renee works for me now also!